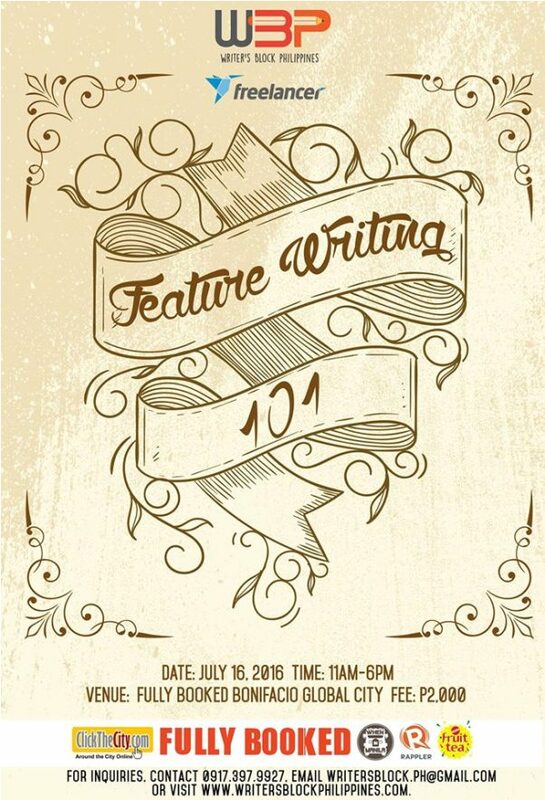 Writer's Block Philippines will be holding a feature writing workshop on July 16 (Saturday) at the Fully Booked branch in Bonifacio Global City. The workshop will cover the "basics of writing feature pieces fit for general themes". The organizers added that the workshop will "focus on the building blocks of effective feature articles that you would be proud to sign with your byline". This workshop will be beneficial to aspiring writers, bloggers, those working in public relations, freelance writers, social media or community managers, those working in the field of communications, and anyone who just wants to be able to write more effectively. The registration fee for the workshop is 2,000 pesos per person. Among the topics to be discussed are news versus features, finding a story angle, writing hacks, different kinds of feature stories, putting more oomph in your stories, and writing the lead for your story. The event will be hosted by Ana P. Santos and Nikka Sarthou Lainez, the duo of writers behind Writer's Block Philippines. For more information about the workshop, check out the details here.